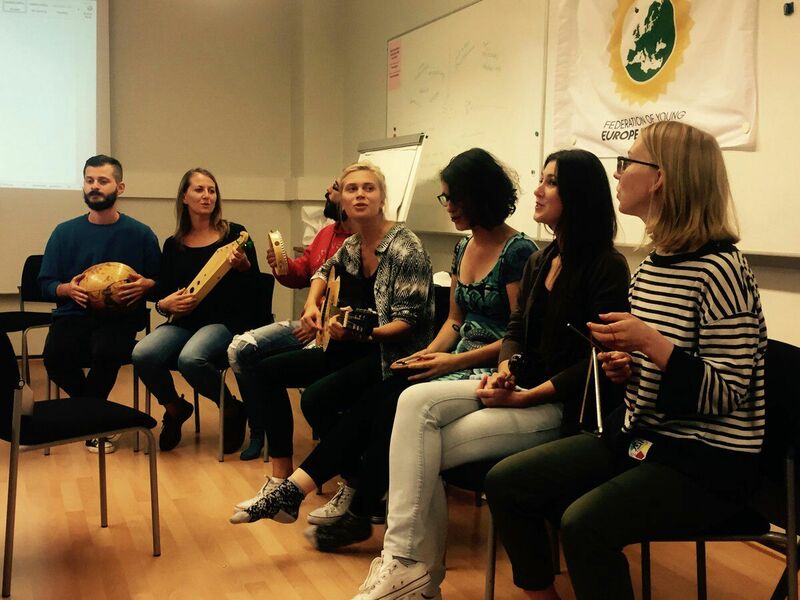 Last September I was one of the fortunate participants in the FYEG seminar “Arts, Crafts and Politics” in Helsinki. The program was aimed at young creative people that want to get their voice heard for a fairer and greener society. Focusing on the skills of how to create a successful campaign, but with a twist by emphasis on how to use creative ways to approach people, for having an impact. Politics can often seem complicated, and can easily feel like this overwhelming set of rules. A place where it is difficult for some people to participate. However, this seminar reached out for both young people, as well as those that offer a different set of skills than are stereotypically associated with politics (without disclosing them). There are many groups of people that need their voice to be heard, and the beautiful thing of arts and crafts is that anyone can participate. Everyone has their own skillset, and can participate in one way or another – whether it be as the performer themselves or as part of an audience, commentators or public discussion. These are all important parts of the artwork and will send the message across. Therefore by giving creative people the skillset to get their work across it furthermore continues to have affect and inspire others to participate, and see that one does not have to fit into a standard frameset of a politician in order to get involved with politics, but that anyone can participate. Arts and crafts is by nature something very physical, it is something we see all around us which makes it both relatable and approachable. More importantly, it is a good way to evoke emotion and get a lot information across without draining people’s energy with blocks of text, that many will most likely not read (something I can admit I am also guilty of). It all boils down to communication, we live in a world of social media, where every single person that participates in gets over flooded with information. In order to reach people, we must realise the power of those gifted in creating relatable content, whether it be visual pieces of work such as pictures, sculptures or embroidery. Something auditorial like poetry or music, we can even include both in acts of performances, the ways of art are only limited to thoughts by those willing to get a point across. We can create content that can really touch people and influence them to pay their attention to things that really do matter to them, and furthermore do better themselves. Now that you are hopefully convinced by the importance of artists and crafters in our community, I will start discussing what I learned and my experience during the seminar. First and foremost I have to thank everyone involved in the seminar: our hosts, the organisers, fellow participants, all the lovely people of Helsinki and everyone else I probably, but regretfully have forgotten. Not only were these people a good company and made my stay enjoyable, but does it remind me how important it is to listen to other people and learn from them. The energy created by a group of people coming together with very different background but still share the same values is something indescribable in the most positive way. It is important to know that the power of having a seminar can not only teach valuable information, but it also inspires other people to try to influence their environment. Feeling the experience first hand, I also see it as a lesson that I bring home with me. That bringing together people is an important force to be used, that together we create a unique energy. Step 2: Bring out the tools! Secondly there were a lot of mental tools we learned, through exercises in bigger and smaller group. Creating space for every individual to share their story and their own approach. We also got some training in how to structure a campaign: a what, how, when to plan for certain events, and to not only expect setbacks but to plan for them, even use them as our strength. Another tool was how to communicate with the public, to try to spot willing actors and their talents, and by coming together we can make something happen. Different theoretical approaches to situations we might encounter and most importantly how, when and where to communicate to the public. Timing can be essential and to create a campaign there are very important steps to follow. During the earlier steps we gather both information about our cause, but also allies. Everyone has their own values and can be activated to work towards them, but it is our job to make them feel included, creating the siblinghood of men. Connected people in a digital age. Sometimes including the power of technology as well as the raw physical contact, or best of all a creative mix of the two. Thirdly we all got our space to be creative, we got to do presentations of the work that we did, with no clear guidance, and you had to be there to see it, but believe me when I say they were amazing. We also got to do some hands on arts and crafts with our own personal political twist. So through experience of knowing that we are being heard, that we had something to say and experimenting with what we could do. There came a snowball effect of ideas, not only from our own minds, but from seeing what is possible through those of others. Also that information does not have to be boring or stale, that there is a time and place for everything and being a bit silly does not delegitimize the message, but makes it more human. Increasing the flood of ideas of what else could be done came also through demonstrations from other real life artivists. Realising that historically art has been both a valuable tool and a commentary in politics, which could be taken even further. Finding out that art connects people in a new way compared to protesting and petitions. To quote my favorite musical “the opposite of war isn’t peace, it’s creation” (Rent, 1996). Lastly the knowledge from experience, we had some great lectures from experienced politicians that have been in the field of politics and had to face different problems. Problems including the general opposition when raising their voice for the sake of our planet, with a new (seemingly) utopian idea – later on they can and do become reality. On the other spectrum there were people discussing their first hand experience in campaigning including both the struggles and victories they have made throughout their journey. when everything is so urgent so it sometimes gets left behind. So no matter how you do it or whatever you do, always remember to make room for having fun and celebrate the big victories as well as all the small ones!